Have you ever wished Internet Marketing was easier? It's easy to over-complicate Internet Marketing. We're here to help you with that. 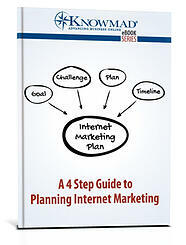 Download this free 4 step internet marketing planning template to help you streamline your planning process. Using this approach, you can avoid the internet marketing affliction often referred to as the 'shiny object syndrome'. Complete the form to the right and we'll send you our Internet Marketing Planning Template.